After the polling date for Malaysia was announced—May 9th, a weekday, oddly—citizens started scrambling to submit their leave application (it was later declared a public holiday in Malaysia) and, for those who are outstation or working overseas, snatching up bus, train and flight tickets for the journey back home to cast their vote. But that’s still not enough. So, a rather heartwarming scenario is unfolding, as Malaysian citizens started offering via Twitter to pay for the travel costs of fellow citizens who can’t afford it. Well, that’s lovely, but not the most efficient way of matching willing giver to needy receiver. 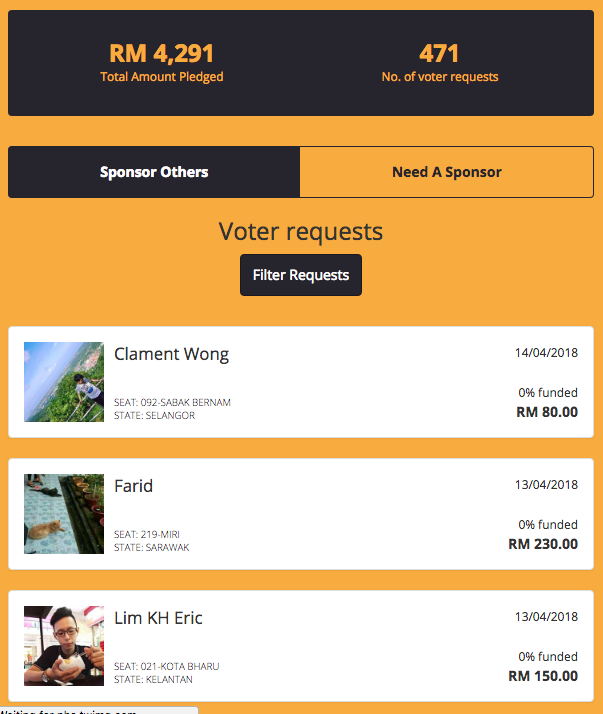 So, several Malaysians have set up a simple website to match these people up. The Star reported that these were actually two groups of people who came together when one group wanted the domain www.pulangmengundi.com (return to vote), but it had already been snatched up by the other. But since both had the same goal—ie. to help people return to where there are registered to vote on polling day—they decided to combine forces and resources. 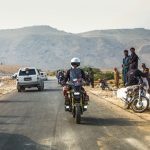 The website facilitates two needs: financial subsidy and transport. 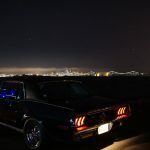 You can offer/request for a ride or money to purchase tickets. To prevent fraud, users have to sign up via Facebook, as a form of verification. There are not many safety or fraud prevention features, except users are encouraged to exchange numbers and conduct some preliminary interviews via chat and video calls. In other words, everyone has to exercise caution and—simply—have trust. There is a “Report User” button to flag suspicious users, but that’s about it. After all, it is a non-profit site set up by a few well-meaning Malaysians. And the sense of “muhibbah-ness” (camaraderie and unity) is strong here. 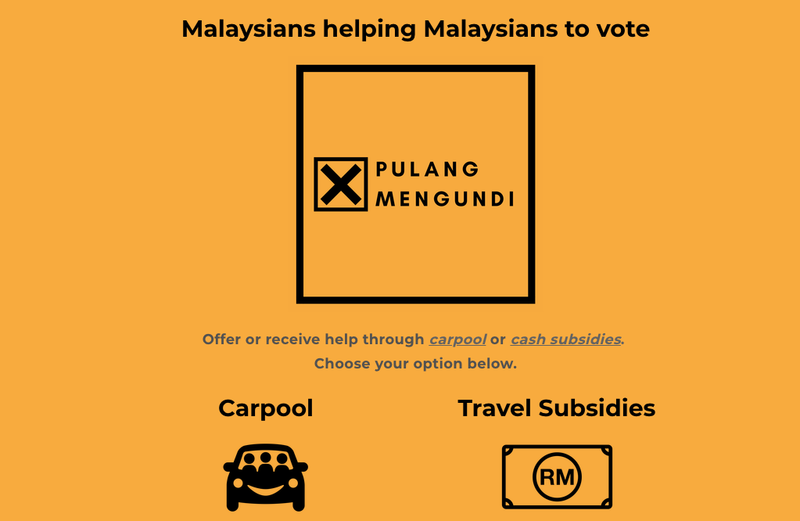 While at time of publishing, only over RM4,000 have been pledged and almost 300 rides have been offered, you know what they say: Every Vote Counts! 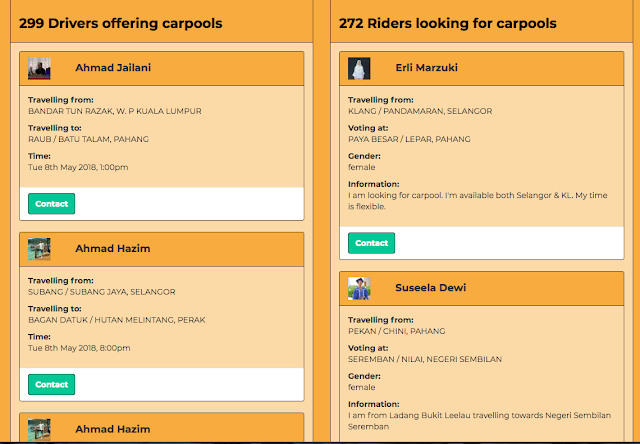 If you’re keen to offer/subsidise transport or need a ride or subsidy, visit www.pulangmengundi.com lah!